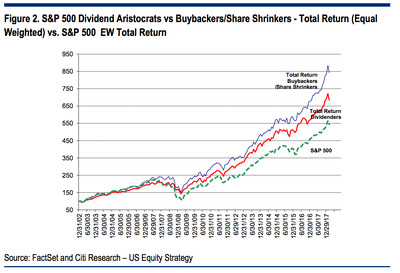 Companies that consistently buyback their shares outperform those that regularly pay dividends, according to Citi’s Tobias Levkovich. Buybacks have helped support stocks at times when mutual funds and other large investors backed off. Critics of buybacks say that they’re often done solely to meet Wall Street’s earnings-per-share estimates and help company executives earn bonuses tied to stock performance. There are two primary ways public companies return capital to their shareholders: by paying out dividends or buying back shares. When companies throw cash at their own stock, they reduce the number of shares outstanding and signal their stock is undervalued. This year, companies are set to spend up to $US800 billion on buybacks thanks to the windfall from corporate-tax cuts, according to JPMorgan’s estimates. Critics of buybacks say that they’re often done to boost earnings per share and help company executives earn bonuses tied to the stock’s performance. Dividends, on the other hand, are paid straight to shareholders. 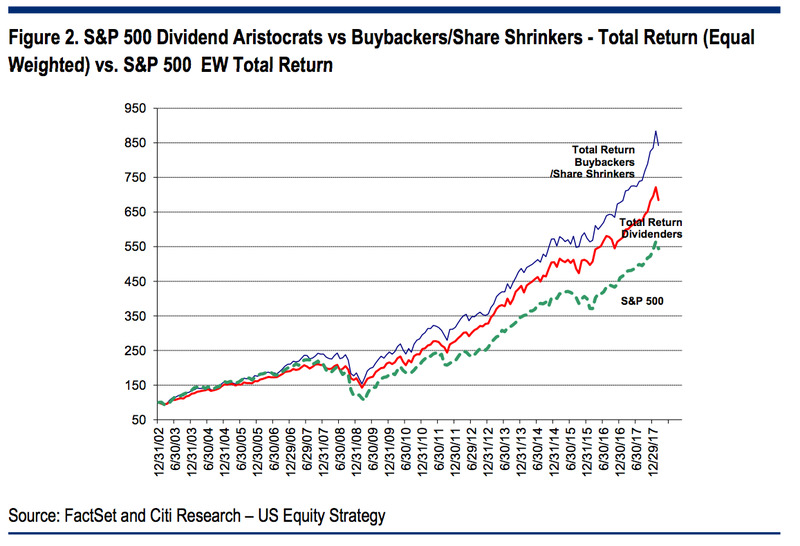 According to Tobias Levkovich, Citi’s chief US equity strategist, it’s more profitable in the long run to stick with companies that consistently buy their own stocks over those that regularly pay dividends. “Our focus remains on serial share shrinkers or companies that reduce their share count every year and thereby show managements’ dedication to generate shareholder value,” Levkovich said in a note on Wednesday. Levkovich acknowledged that company buybacks have intervened in periods when mutual funds and other large investors were reluctant to buy stocks. He added that in fact, domestic mutual fund and exchange-trade fund flows have been negative every year since 2015, but buybacks have helped fill the void. But the chart below shows that on a total return basis, companies that consistently buy enough of their stock to reduce the count of outstanding shares are more rewarding. Examining share-price performance is the most useful way to assess which is better between buybacks and dividends, Levkovich said.